If God does not exist, objective morals do not exist. Without God, the universe is a mysterious accident. Life is an accident. The fact that we can contemplate our existence and wonder about our purpose is a horrible disfigurement of human nature brought on by runaway genetic mutation. Thinking about purpose in a world that has none can only lead to despair. As a result, our deaths are meaningless conclusions to the senseless banging together of the particles that comprised our bodies. If we die young, it is neither right nor wrong. If our lives accomplish nothing, it is neither right nor wrong. If we hurt others or are hurt ourselves, there is nothing fundamentally right or wrong about the hurting. Wanting to improve humanity is a silly misfiring of genetic inclinations to preserve ourselves, all of which will be rendered utterly stupid when the universe eventually expands to the point of its inevitable heat death. 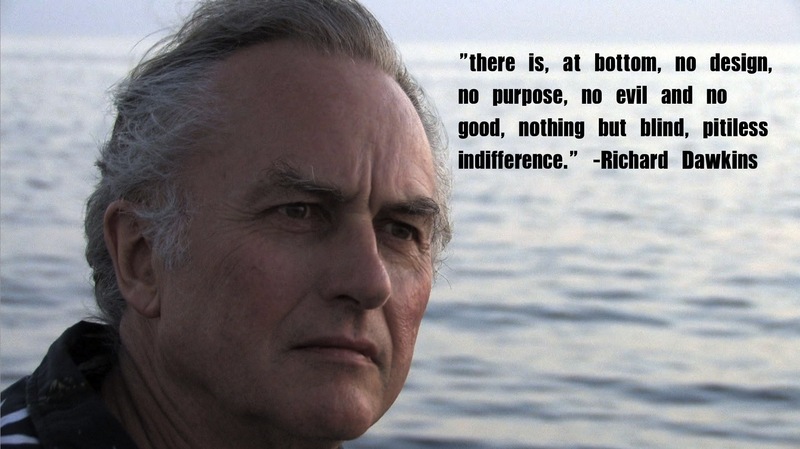 So must the atheist be nice? By no means! And it is not wrong for him to be mean, because in the atheist conception, there is no real right or wrong. There is only impulse, social contract, and group think. These questions would come a lot more clear if we would start defining morality as a logically obligatory set of behavior-governing principles, at which point we could say definitively that atheists cannot be moral. They can only be nice. And their reasons for doing so may as well likewise die an early heat death. Can atheists be moral? Not by this definition. They can go along with the group will of the day, constantly open to the option of abandoning public consensus for the sake of personal gain or pleasure. And the most casual study of human behavior will show how likely that possibility is. How is the conclusion any different when a deity is assumed? Unless one has a thoroughly materialist conception of God, there is still no way in which to bridge the existence of God (uncreated, immaterial) to the existence of the universe (created, material) than by any other mechanism but “mystery”. This, in fact, is the what Christians ultimately describe divine creation as, and rightly so. I’m not particularly sure why the absence of God in relation of the existence of the universe implies that existence is an “accident”. In fact, the use of the pejorative “accident” *seems* to imply not the natural, amoral consequences of physics, but rather an incompetence or malevolence on the part of some assumed player in the drama of the universe’s existence…which of course doesn’t make sense if the assumption of a non-material, non-created being is not assumed. Why is this a necessary conclusion? How can that which arises from the amoral processes of the universe be described as a “disfigurement”? Your presuppositions about “the way things really are” (e.g., theism) are corrupting your exposition of an alternative viewpoint. Again, why is this a necessary conclusion? Why should one not equally despair about a purpose imposed upon one by a creator? Such statements are pure rhetoric, but have no philosophically compelling basis. Isn’t the answer ‘NO’ to any formulation? Clearly the insertion of ‘atheists’ in your preliminary question makes no assertion about atheists that can’t be made for *any* group you care to suggest. I am sorry … the appearance of your ability to argue a reasonable point is pretty much obliterated by this sort of cheap sophistry. It seems like you’ve had trouble following the argument, both through your confused symbolic interpretation below, and now through an almost nonsensical response here. Yes, Christians can commit to binding behavioral obligations that they are not free to violate without hypocrisy or deceit. This is just obviously true. I commit to the moral obligation not to abuse children for fun, because my God dictates that I should not. As a result, if I do abuse children for fun, I’ve made myself hypocritical. Meanwhile an atheist can find no source for such binding commitments. Whether or not one is a fireman is irrelevant, and I’m not sure that you even had a clear thought when you wrote that, which makes it bizarre that you would accuse anyone of sophistry. Your whole argument is predicated on an ungrounded assumption for which you provide no authority whatsoever and your opening syllogism is logically invalid. The conclusion does not flow from the premises. a logically valid syllogism could be formed by changing the firt premise to ‘B if and only if A’ but I do not see how you can establish that as a given either. The argument is logically valid, and it’s an example of a modus tollens argument. You need to build a truth table and you’ll understand how modus tollens works. What you’ve done here is not equivalent to the structure of moral argument. Your second premise is “-Q”, whereas mine is “Q”. I’m not sure how to help you if you fail to see this straightforward error. I totally understand what you’re saying. Thank you both for pointing this out! So sorry about the confusion, Sybaritica and Pastor Miller! Also, Pastor Miller, I mentioned that it isn’t clear that your first premise is true. As far as I can tell, God’s existence may be a sufficient condition for the existence of objective morality. However, it isn’t clear that God’s existence is a necessary condition for the existence of objective morality. Your argument is valid. But, I’m unable to determine whether it is sound, because your first premise seems to be a FAITH proposition, not a fact. Why should I believe that God’s existence is absolutely necessary to the existence of morality? Lastly, my belief that objective morality exists, whether true or false, IS the rational basis for my acting kindly. Yet, my formulation of this belief doesn’t require God’s existence. You write to Sybaritica: “I commit to the moral obligation not to abuse children for fun, because my God dictates that I should not.” …Your God may dictate to you that you should not abuse children for fun. But, what is the practical difference between your God doing so, and your BELIEVING that your God is doing so (when, in fact, He may not exist)? In fact, it may be the case that God is doing so, yet you may not believe this (as you would probably say of atheists). However, the fact that you BELIEVE that God is doing so provides the rational basis for your actions, in the same way that my BELIEF that objective morality exists provides the rational basis for my actions. We BOTH care whether our beliefs are true or not! Of course we do! But, when it comes to their being a rational basis for our actions, it doesn’t matter. In the case of rationality, what only matters is if our actions are in accord with our beliefs. It isn’t clear that God’s existence is necessary for objective morality to exist. Actually, the quick and standard rejoinder is “you haven’t defined what you mean when you say ‘objective’ to the satisfaction of atheists, nor demonstrated that objective morals exist.” I don’t care if you think I’m an immoral person. What I’m saying here is fairly obvious, making the questions sound more like avoidance than a serious consideration. Objective moral values would be binding values regardless of the feelings of the human subject and stemming from a source outside of those feelings. And the demonstration of their existence is that you already believe in them, as does everyone else, as evidenced by your sense that truth matters. If you are merely a collection of particles heading towards a meaningless termination, it wouldn’t matter whether or not you believed things were true, and you wouldn’t be trolling around blogs looking for arguments. So given that you already seem to believe in objective moral values, and since those values could not exist in a sheerly material universe, you already have a pretty good sense that God exists. Ah, so alien moral values would be objective? It wouldn’t matter to whom? It would matter to me. I don’t care if it matters to you. Nope. I believe in situational moral values as determined by reason, logic and evidence. No I don’t. I understand pretending that I does probably makes you feel better, though.